Guard your cells from free radical damage with a high dose of resveratrol plus extracts of blueberry, grape seed, milk thistle and glutathione. 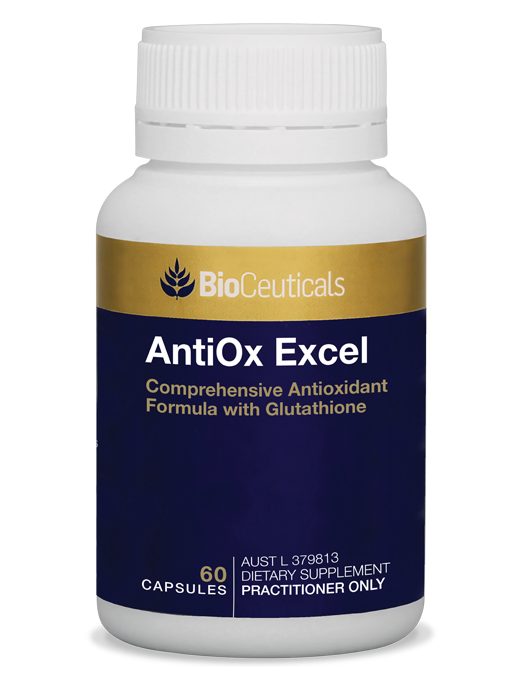 AntiOx Excel provides a comprehensive antioxidant and free radical scavenging formula to support and maintain general wellbeing, cellular health, liver function, and detoxification and inflammatory processes. 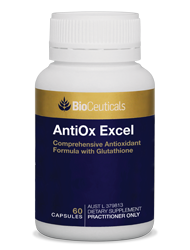 This time-honoured product has been upgraded to include the clinically trialled Setria® reduced glutathione, as well as cofactors involved in glutathione synthesis (vitamin B3 and alpha-lipoic acid) and the EVNolMax™ complex of the eight isomers of vitamin E.
Contains nutrients required for glutathione and antioxidant regeneration. Silybum marianum (milk thistle) is traditionally used in western herbal medicine to support liver and gallbladder function. Helps support the regeneration of liver cells. Supports detoxification processes of the liver. Helps reduce markers of inflammation. With clinically trialled and bioavailable Setria® reduced glutathione. With EVNolMax™ vitamin E complex providing the full spectrum of eight naturally occurring isomers of vitamin E as found in nature (tocopherols – alpha, beta, gamma and delta, and tocotrienols – alpha, beta, gamma and delta). Provides rich sources of antioxidants including resveratrol, proanthocyanidins, lycopene, flavanolignans and carotenoids. This product contains selenium which is toxic at high doses. A daily dose of 150mcg for adults of selenium from dietary supplements should not be exceeded.